by PokerAnon ~ February 17th, 2010. Filed under: Basics of poker, Philosophy and approach. At the poker table there are always adjustments to be made. Some are simply because we get different cards every time we play. Adjusting for the cards that we are dealt is the most basic adjustment. If we get crappy cards for the first 20 hands, we do a lot of folding. If we get some big pairs, we play more hands. But there a lot more adjustments. Some even take priority over the strength of the preflop cards, and even early, as in the first 20 hands. You’ll see a lot of people who have some kind of idea which hands to play; at least they’ll fold most of their hands at a full ring table. But they’ll be indiscriminate; they’ll play the same hands regardless of whether they’re in early position or late position. A 4 ? Well, if I can limp it behind in late position, maybe if I limp from early position everyone will limp behind and it’ll be the same thing! Then they’ll try to do the same when they go to try a super turbo where they start with 10 big blinds, or the same in a freeroll, or heads up at the end of a sit and go. Adjust, people, adjust! Play more hands against bad players, play more hands when you are in position, play more hands when the table is shorter. Raise a wider range when the table or the opponents to your left are tight. Be selective in your hands against loose-aggressive players. 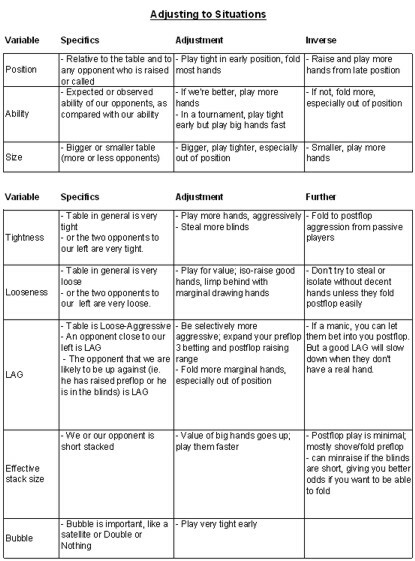 Also play fewer hands when the effective stacks are small, when you are early in tournaments against weak players, and also when the bubble is important, as in a satellite tournament, but play the big hands aggressively to minimize the chances of getting sucked out on. The Free, Online, Concise, Simple Guide for Beginners to No Limit Hold em Poker. Advice for beginning poker players including strategy, a demo video, and tips! - "Your reverse implied odds are terrible"
Theme created by PokerAnon from a blank; ask if you want a copy.